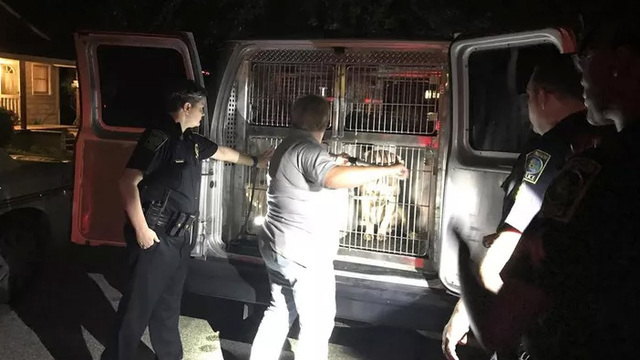 Dogs Bite Decatur Al: WILMINGTON NC - A WOMAN WAS FOUND UNCONSCIOUS INSIDE A HOUSE WITH A PIT BULL STANDING OVER HER AND WITH MULTIPLE BITE WOUNDS ...THERE WERE MULTIPLE DOGS INSIDE THE HOUSE ...THE OWNER IS IN JAIL!!! WILMINGTON NC - A WOMAN WAS FOUND UNCONSCIOUS INSIDE A HOUSE WITH A PIT BULL STANDING OVER HER AND WITH MULTIPLE BITE WOUNDS ...THERE WERE MULTIPLE DOGS INSIDE THE HOUSE ...THE OWNER IS IN JAIL!!! (WECT) - A Wilmington woman suffered serious injuries after a PIT BULL attacked her late Wednesday night, according to the Wilmington Police Department. Police responded to a home in the 1200 block of Spofford Circle around 10 p.m. after receiving a 911 call from a neighbor who had been bitten by the dog. When officers arrived, they found the pit bull standing aggressively over 31-year-old Mary Hinson who was unconscious and suffering from multiple bite wounds. Officers tased the dog and managed to pull Hinson to safety. She was taken to New Hanover Regional Medical Center where she underwent emergency surgery. Hinson is currently in stable condition. During the investigation, police learned that Hinson did not have permission to be inside the home from the owner, Sherry Spivey, who is currently jailed on unrelated charges. Officers found multiple dogs inside the home, which is in poor condition, and turned over the dogs, including the pit bull, to Animal Control.